Java Virtual Machine (JVM) is a run-time system that executes Java bytecode. The JVM is like a virtual computer that can execute a set of compiled instructions and manipulate memory locations. When a Java compiler compiles source code, it generates a highly optimized set of instructions called bytecode in a .class file. The JVM interprets these bytecode instructions and converts them to machine-specific code for execution. JVMs are implemented for different hardware platforms and Operating Systems, such as Windows, IBM Mainframes, Linux, Mac OS, and so on. Though the implementation details of the JVMs are different, they are all capable of executing the same bytecode. A Java program that is converted to bytecode executes the same way on different platforms. This is possible because only the implementation details of the JVMs differ from one platform to another. All the JVM implementations are capable of interpreting and executing the same bytecode. Therefore, there is no need to compile each Java program into the native code of individual machines. In this way, Java supports the powerful “write once, run anywhere” feature. JVM is a controlled environment that provides the necessary memory for a program to execute. Because the JVM provides memory management and garbage collection functionality, it can prevent programs from illegally accessing memory and causing harm outside of the run-time system. The portability offered through JVM is a huge advantage for web-based programs because there is no need to create different versions of a program for different platforms. The web connects systems with many different hardware and software environments. As long as a system implements the required JVM, any Java program that is compiled into bytecode can be executed on it. JVMs include a Just-in-Time (JIT) compiler to speed up execution times. A JIT compiler is a part of a JVM that converts portions of bytecode into machine code at the time of execution. This on-demand translation of bytecode reduces the overall execution time of Java programs. The Java Development Kit (JDK) is a software development environment that you can use to develop and execute Java applications. It includes the JRE and a set of programming tools, such as a Java compiler, interpreter, appletviewer, and document viewer. The JDK is implemented through the Java SE, Java EE, or Java ME platforms. java: A loader for Java programs that interprets the Java bytecode in .class files and converts them to machine code. javac: A compiler that converts Java source code to bytecode. appletviewer: A tool that is used to run and debug Java applets. jar: An archiver that packages related class libraries into a single file. javafxpackager: A tool that is used to package and sign JavaFX applications. The Java Runtime Environment (JRE) is a part of the JDK that includes a JVM, core classes, and several libraries that support application development. Though the JRE is available as part of the JDK, you can also download and use it separately. JVM that includes Java HotSpot Client and Server VMs. Util and lang base libraries that include lang and util, Collections, Preferences API, Regular Expressions, Logging, and so on. Deployment technologies such as Java Web Start and Java Plug-in. UI toolkits such as AWT, Java 2D, Swing, Sound, Image IO, and so on. Integration libraries such as JDBC, IDL, RMI, and so on. Other base libraries such as Beans, Networking, Security, Serialization, international support, IO, and so on. JDK is a superset that contains JRE whereas JRE is a superset that contains JVM. JVM does not compile Java source code whereas JRE includes a compiler for Java source code. JVM does not include software development tools whereas JDK and JRE provide several tools for application development. JDK includes compilers and debuggers whereas JRE and JVM do not include these tools. JVM, JRE and JDK these all the backbone of java language. JVM, JRE and JDK are the most common terms which are often heard in Java. 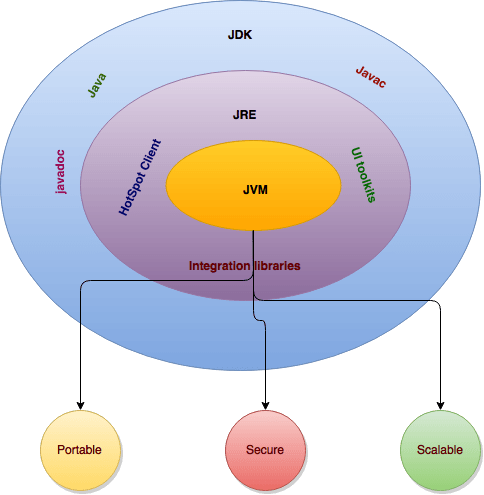 It is very important for a Java developer to know the concept of JDK,JRE and JVM.